Well it looks like the rain isn’t over yet. We ended up with seven inches last week from the remnants of Fay and with hurricane Hannah on the way there could be a whole lot more. We had water moving debris in places we have never seen before. Of course the driveways that I had just regraded are all now back down at the bottom of the hill. The most interesting were the leaves and sticks that washed out of the small gullies that are across the heavily wooded hillside between the top fields and the bottom fields. The river backed up on the bottom field for the first time in several years but only on the lower end. It got within about a foot of the irrigation pump, which we are always prepared to pull out if need be. It has dried out nicely now and the mowing has begun. Nothing like a little water to make weeds and grass, pent up from the drought, go wild. Betsy has been on the small mower for two days getting all the grassed areas and I have been on the tractor taking out the summer cover crops, old flower crops and areas we haven’t mowed for some time. This will be the last mowing for the season on a lot of the farm so it is very satisfying. Mechanical frost we like to call it. 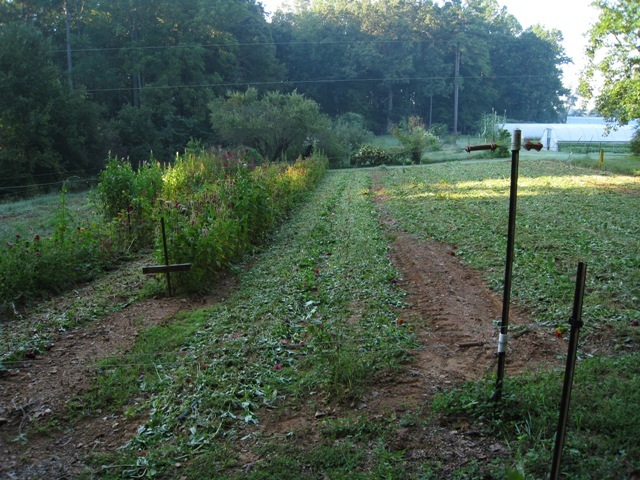 After this next storm (assuming there is not another on its heels) I will begin turning soil over and getting ready for the winter cover crops. No newsletter next week as we will be in Portland Oregon for the 20th Association of Specialty Cut Flower Growers conference. I think that Betsy has been to nearly every one and this organization has been very important to the growth of her/our cut flower business. She has served on it’s board of directors as both regional director and treasurer. She now is the executive director of their Research Foundation. It is always a good time with interesting tours of farms and of course checking in with old friends. We will be back in time for next Saturday’s market though.